A. 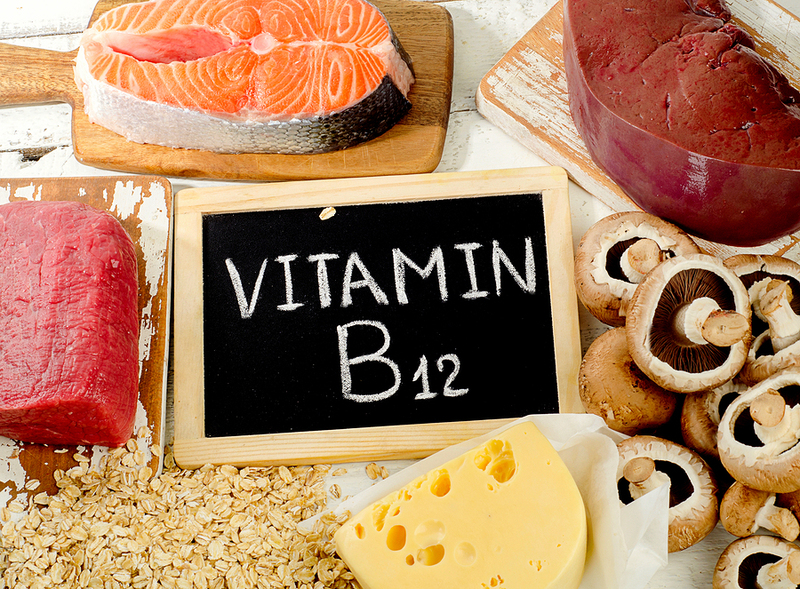 Suspected vitamin B12 (cobalamin) deficiency can be hard to prove, as was underscored by a recent case report from Dr. Jerome Franques and a team of French clinicians (Nutrients. 2017. 9:281). A 30-year-old woman with AN complained of painful paresthesias of her feet and, just like your patient, these painful sensations had developed relatively rapidly. There was no past medical history. The patient had lost 10 kg during the prior 4 months as a consequence of her AN. Clinical examination showed only hyperpigmentation of her skin, and a neurologic exam revealed diffuse areflexia and hypoesthesia. Lab studies showed low folate levels (4.9 nanomoles/liter [nmol/L], compared to normal levels that are usually >7 nmol/L) with normal serum B12 levels. The patient was treated with vitamins B1, B6, and B9, in normal dosages. Her skin symptoms responded, but 3 months later she was hospitalized because of subacute proprioceptive ataxia, which was leading to frequent falls. Despite treatment with the B vitamins painful paresthesias persisted in her hands and wrists. Her folate levels had normalized and serum B12 levels remained normal. However, several factors pointed to the possibility of B12 deficiency: hyperhomocysteinemia (25 µmol/liter; normal is <15 µmol/L) as well as macrocytosis (MCV) without anemia (the blood cell count was completely normal), pointed to the possibility of B12 deficiency, and the patient was given a daily series of 1000-µg injections IM for 2 months. Although her anorexia continued, the injections significantly reduced the paresthesias, and both the homocysteinemia and MCV returned to normal. Five months later she could was walking normally. Nine months after the last injections, she had no more unusual symptoms in her hands and arms and normal sensation in both feet. This case demonstrates the poor sensitivity of tests currently available to measure B12. The authors suggest that one way to counteract this is with a therapeutic test of B12 supplementation, either with injections or oral tablets. In a study by Solomon, 83% of patients with neuropathies (including 35 with known causes of neuropathy other than vitamin B12 deficiency) improved after receiving oral or parenteral B12 (Nutr Neurosci. 2016. 19:162). The oral form is usually enough to reach target serum B12 levels. An alternative approach would be to fully assess the signs and symptoms of B12 deficiency, including paresthesia and macrocytic anemia, but also to watch for sore tongue, gait disturbances, and skin hyperpigmentation.